Are you looking for a unique gift for the kiddos this holiday season that is easy on the pocket book? Tired of the ol’ corn cob pipe and the button nose? Want to just give your neighbours a good chuckle? 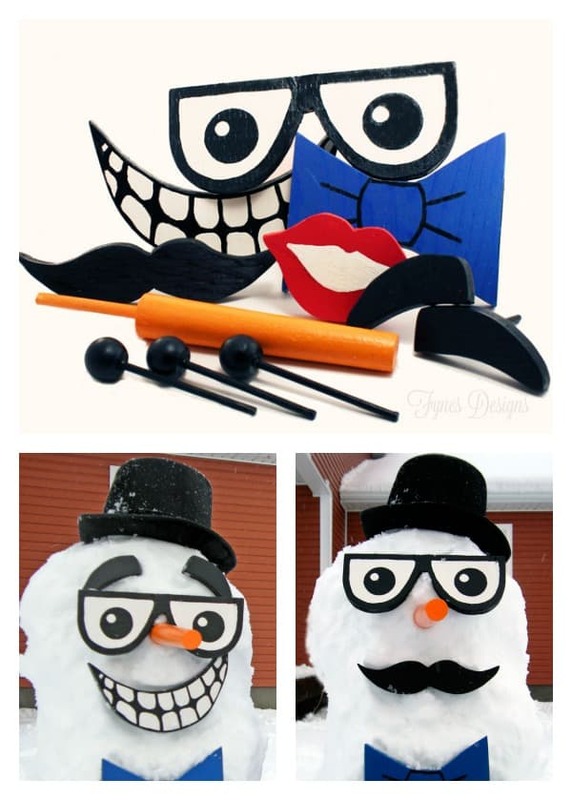 Then you need to make your own snowman kit! 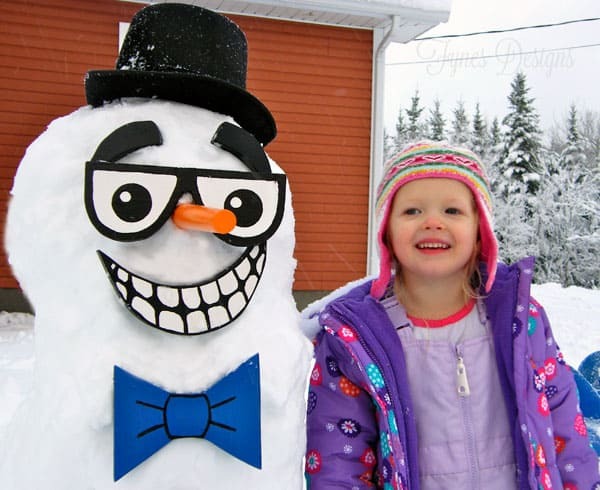 It only takes a few supplies, and a little handy-work and you’ll have the kids making the funniest snowmen this side of the North Pole! Find a few free photo prop printables online. Print and cut out to use as a template for the snowman kit pieces. 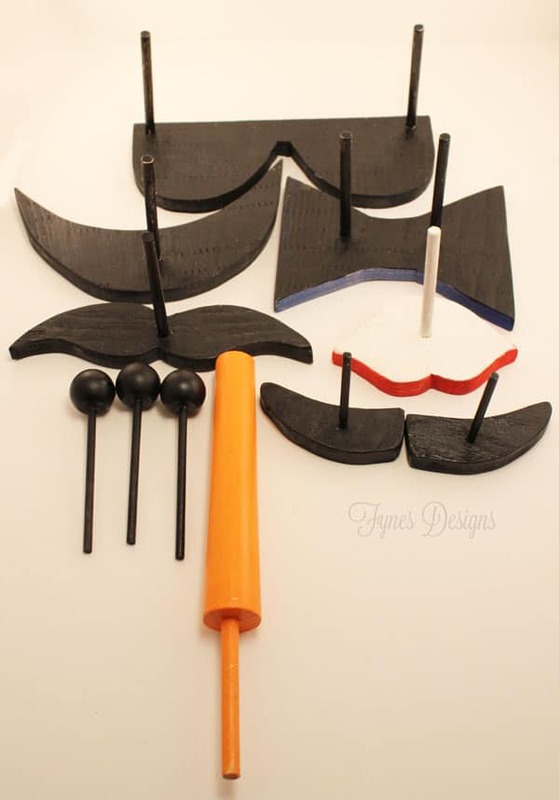 Here are the ones I thought worked great- Moustache and Lips Printable, Tie and Moustache Printable, Hat and Glasses Photo Booth Props. Trace the shapes onto plywood (scraps work fine) my scraps were 3/8″, and use a jig saw to cutout. For the nose I used a piece of a spindle left from a previous project (a large dowel would work). Cut a dowel into pieces about 5″ long. Drill holes a tiny bit smaller than the dowels into your plywood pieces, making sure you do not drill all the way through. Put a bit of wood glue into the holes and force the dowel into the hole, hammering them in, if need be. Allow the glue to dry. Paint with Exterior paint, making sure to paint the backside too. If you do not have any exterior paint, acrylic paints sealed with Mod Podge would work too. Add a hat and scarf (both I found at the dollar store) to complete the kit. I sewed a small bag to keep the pieces in, the snowman kit is by the door waiting for Jack Frost to arrive! The kit is perfect for our little ones, no searching under the snow for stones, or looking for a carrot at the last minute, it’s all in the kit! 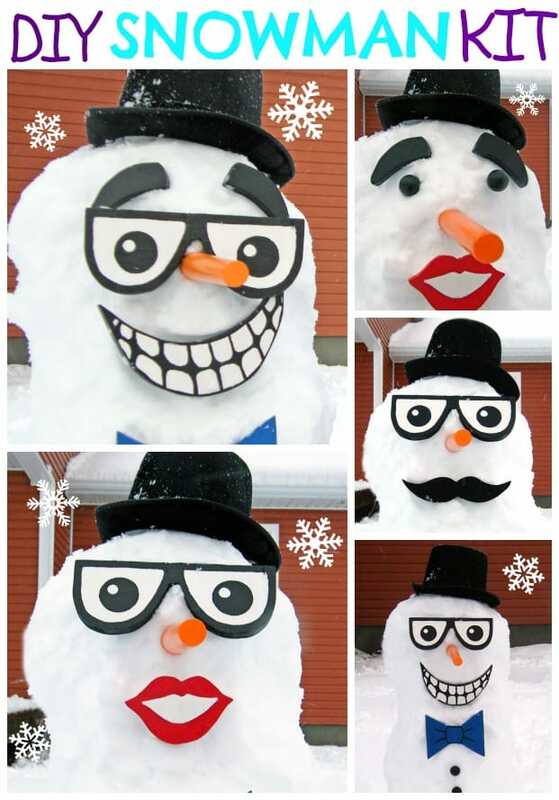 Think of all the combinations you can make with this snowman kit! Do your kids like playing in the snow? Mine can’t wait! Looking for another great DIY kids gift idea? This is fantastic! We’ve only gotten about a centimeter snow on the ground, so we’re going to have to wait for a snowman. But I know that my girls would go crazy for this!